So in six weeks’ time my son turns six. That tiny little baby turned into 3ft of obstinacy and giggles. The last couple of years I have had big soft play parties with slides, mini sausages, the whole shebang. Twenty plus kids and clowns. One thing I notice is that as cute as a big birthday cake looks covered in candles, it never gets eaten and when you wrap it, cut up in even pieces in party bags, it will always come out a squashed mess. The boy and I are makers and lovers of cupcakes. Ours are often wonky and slightly over brown but I thought it would be a better option to make a cupcake tower instead of a cake where each child can have an individual cake. The fun of this, you can get your children involved in the making and basic sponge recipes are easy and cheap. Decoration wise you can go as wild or as simplistic as you want. Go piping bag crazy. Cookie monster cakes always go down well and are a lot easier to pipe than they look. You can also consider photo print cakes, where you can literally eat your child’s face. I wondered about the practicalities of this in terms of how edible the print would be, the quality of the photos and if it was simpler to make my own or order from a company. Caketoppers kindly sent us a sample with some of my favourite pictures of Leo (I wanted to see how different photos and colours would come out.) They arrived unmatched by the postman in a sturdy box which meant they arrived perfect. They come with storage instructions and full ingredients list with allergenic ingredients in bold. Each cake was individually wrapped which means they don’t dry out and we had a choice between chocolate and vanilla. You can guess which one was my favourite. The sponge was moist and they are very generous with the royal icing. The photo’s transferred well, I used high resolution images. A box of 6 photo cupcakes from Caketoppers will cost you £12.99 with an added delivery charge. You can have next day delivery if you order by 2pm for weekday deliveries or by 12 noon on a Friday for a Saturday delivery. This is great if you are organising something last minute! They do offer batches of cupcakes of up to 60 cupcakes with a range of topper choices and flavours. I think it would be a great idea to have an individual photo of each of the children attending a party so they could each have their own personalised cake. For a 10% Reader DISCOUNT code enter TPJ10 at the checkout on the Caketoppers website. 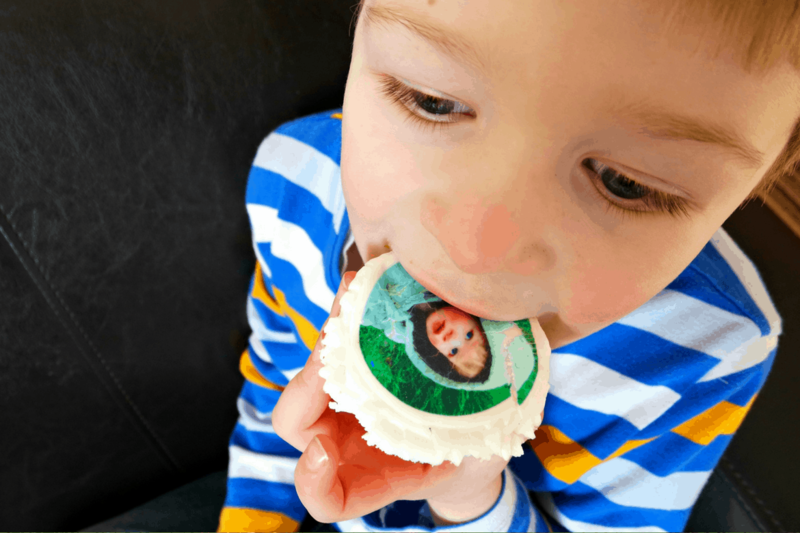 Disclosure: We were gifted a box of 4 photo cupcakes from Caketoppers for the purpose of this review.